Familiprix Quebec Flyer & Hours. 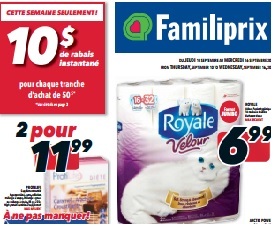 Familiprix 618, Boul Renault, Quebec, G5X 1M8, Quebec store opening hours, weekly flyer, best deals & specials, Boxing Day Sales, location, phone number. Special Store Hours: Boxing Day, Black Friday, Cyber Monday, Good Friday, New Year’s Day, Canaday Day, Labour Day, Christmas Day, Easter Monday, Victoria Day, Thanksgiving Day, Remembrance Day, Family Day or Civic Holiday.